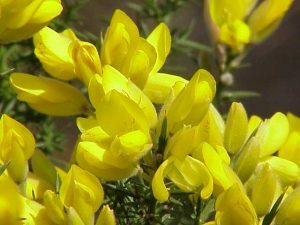 Ulex europaeus is a plant that is better known as the “common gorse” (OK, I’m no botanist, and I don’t live in Europe where this plant flourishes, so I don’t really know it that way, but I guess some people do!). When we extract material from the seeds of this plant (we call the extract a “lectin“), that substance can act just like an antibody against the H antigen. Ulex lectin will react more strongly with RBCs that have more H, such as group O and group A2 RBCs, while reacting much less strongly (if at all) against RBCs with very little H, such as group A1 and A1B. Ulex is used much less than the other famous blood bank lectin, Dolichos biflorus.